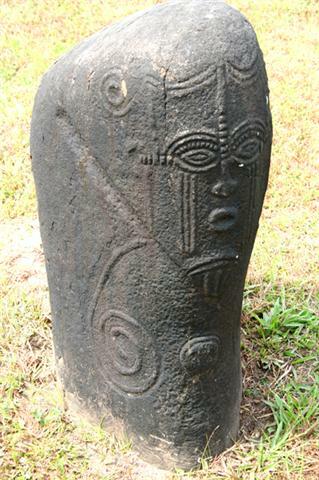 The Ikom Monoliths in SE Nigeria are an important group of c.350 beautifully decorated menhirs, most of them situated in about thirty stone circles. Mainly based on their decoration these are dated to the Iron Age. The stones are located just above the Cross River, at 6oN. It appears, that this River symbolizes the Biblical Flood of c.2344 BC, which happened in the 6th Dynasty. The relation with this Comet Catastrophe is obvious from many geographic features of the site. The Flood lasted for 2 + 2 = 4 months. There were 2.6 million casualties worldwide, and 2.2 million survivors, most of them seriously injured. The total precipitation was about 9 meters of water. Ikom is a town in Cross River State, southeast Nigeria, only 30 km from the border with Cameroon. It is located at the Cross River, which runs from Cameroon to the west over more than 100 km, after which it makes a right turn to the south in the direction of the city of Calabar, where it empties in the Gulf of Guinea (Atlantic Ocean). About 40 km north of Ikom is the village of Alok. It is the center of the so-called Ikom Monoliths. Most of these upright stones are situated in circles of various sizes. The stones are nicely dressed and smoothened. These have heights varying from two to over five feet (0.6 to 1.8 meters), and widths of one to two feet, or so. The majority of the stones are of hard volcanic rock (basalt), but there are also a few of sandstone and limestone. One might wonder about the reason of this important megalithic site around the village of Alok in Nigeria. The first part of the Cross River runs around the latitude-line of 6oN over more than 100 km to the west, in the direction of the south coast of Benin. It appears, that this River symbolized the Biblical Flood, which happened at the start of the 6th Dynasty (c.2344 BC, tree-ring dating). The Biblical Flood was caused by a Comet. It appears, that the Island of Bioco, Equatorial Guinea, due south of Ikom, symbolizes the Head of the Comet. The Sea southwest of this island, in the direction of the Islets of São Tomé and Principe, represents the Tail, consisting of ice and stones. The Catastrophe was caused by a cosmic collision between the planet Earth and the Tail of this Comet. The distance from Alok to the south coast, or from Ikom to Mount Cameroon, equals 2o, or 2 moiras, corresponding to the first time period of 2 months when the Earth was inside the Tail of the Comet. The falling stones were causing horrible forest-fires, and the melting ice resulted in torrential rains and worldwide floodings. It was completely dark on Earth. The distance from these places to the Niger River also equals 2 moiras, which correspond to the 2 months after it. The climate was completely disrupted. The terrible rains continued, but it also became extremely cold. So, the rains changed into ferrocious snow and hail storms. The latitude of the south coast to Cape Formoso, or Mount Cameroon, is at 4oN, confirming these 2 + 2 = 4 months. Cape Formoso, at the southern mouth of the Niger, is located 9o - 6o = 3o, or 3 moiras, west of Ikom (at 9oE), illustrating the 30 days of the month. 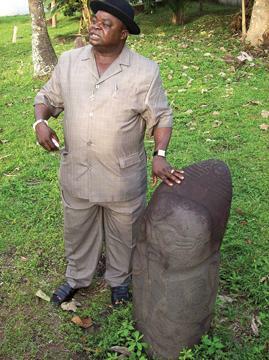 The coast near Benin City, Nigeria, is located 9 - 5 = 4 moiras to the west, confirming the total duration of 4 months. The length of the Niger River, from the confluence with the River Benue to Cape Formoso (the Gulf), equals 8o - 4o = 4o, confirming it, again. The width of the continent of Africa at the level of Terrace Bay, Namibia, at 20oS, equals c.2 Moiras, confirming the two time periods of 2 months. The east coast of the island of Madagaskar at this level is located 49o - 9o = 40o east of Ikom, Nigeria. When measured along the equator it corresponds to 40 moiras, confirming the total duration of the Catastrophe, 2 + 2 = 4 months. Cape Agulhas, the south cape of Africa, is located 6o + 35o = 41o, or c.4 Moiras south of Ikom, confirming it. The south coast of Nigeria, or Mount Cameroon, is located at 4oN, and the confluence of the River Niger with the Benue is at 8oN, encoding the world population before the Flood of 4.8 million men. Cape Lopez (Port-Gentil) is located at 1oS, which is 6o + 1o = 7o below Ikom. It corresponds with the 7 figures of this number. The coast near Benin City, Nigeria, is 9o - 5o = 4o west of Ikom, and the coast near Lomé, Togo, is located 9o - 1o = 8o to the west, confirming this world population. The west side of Lake Chad is located 13o - 9o = 4o east of Ikom, and 14o - 6o = 8o north of this town, confirming this original world population of 4.8 million men, again. The east side of Lake Chad, is located 13o - 6o = 7o north of Ikom, and the coast of Benin, confirming the 7 figures. Terrace Bay, Namibia, is located 13o - 9o = 4o east of Ikom, confirming the duration of the Flood, 4 months. It is located 20o + 6o = 26o below this town, encoding 2.6 million casualties (54%). The town of Beira, at the East Coast of Mozambique at this level, is situated 35o - 9o = 26o east of Ikom. It corresponds with 26 moiras when measured along the equator, confirming the number of victims. The Strait of Bab al-Mandab, the entrance of the Red Sea, is located 13o - 6o = 7o north of Ikom, confirming the 7 figures of this number. Cape Verde, the west cape of North Africa, is located 17o + 9o = 26o west of Ikom, confirming it. The maximum width of the continent of Africa is 17+51= 68 moiras, or about 7 Moiras, confirming the 7 figures of the number. The Sahara desert is called after king Sahura of the Fifth Dynasty, who reached America via the Atlantic for the first time. The Niger River has the shape of a huge pyramid (see fig.3). The town of Bamba, in Mali, is located near the top of it. Its name resembles that of Benben, the Egyptian name for the top of a pyramid. Ikom, and the south coast of Benin, are located 6o - 4o = 2o north of Cape Formoso, at 6oN, confirming the 2.6 million casualties of the Catastrophe. The important Strait of Gibraltar as well as the island of Malta are located at 36oN. The complementary latitude of 90o - 36o = 54oN confirms the percentage of casualties, 54%. In antiquity, the use of complementary latitudes was very common. The distance from Alok to the south coast, or from Ikom to Mount Cameroon, equals 2o, or 2 moiras, and the distance from these places to the Niger River equals 2 moiras, confirming the 4.8 - 2.6 = 2.2 million survivors. Most of them were seriously injured. Ponte Albina, the west cape of southern Africa, is located at 16oS. This is 16o + 6o = 22o below Ikom and Benin, confirming the number of survivors. It is also located 12o - 9o = 3o east of Ikom, illustrating the 30 days of the month, again. The Nile Delta is located 31-9= 22 moiras to the east, when measured along the equator, confirming the 2.2 million survivors. 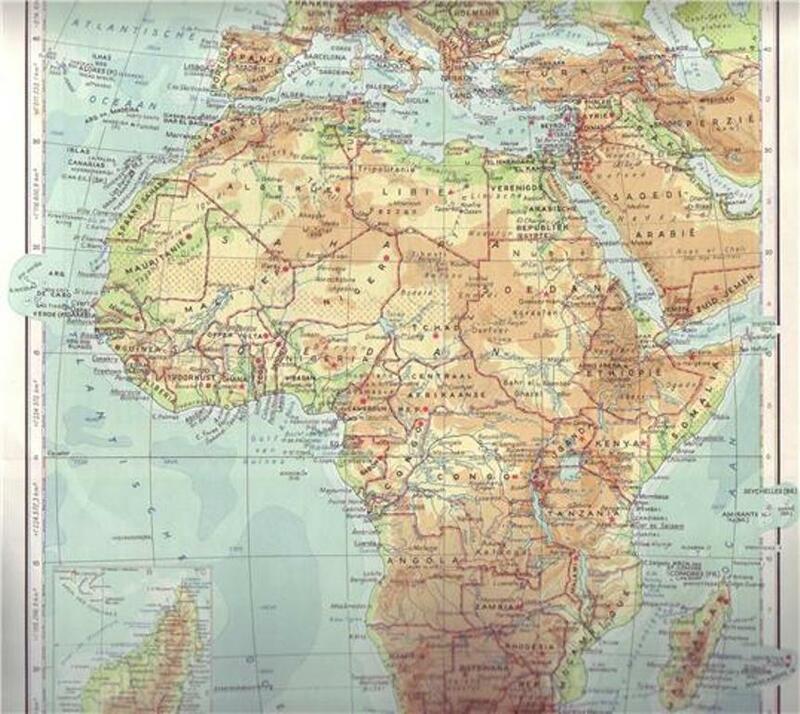 The maximum height of the continent of Africa is 37o + 35o = 72o, or about 7 Moiras, confirming the 7 figures of this number. The western mouth of the Niger River is located at 5oN, encoding the 5th Dynasty, which was finished because of the Comet Catastrophe. Both the town of Ikom and the upper part of the Cross River are situated at 6oN, because it occurred in the 6th Dynasty. Ikom, and also Benin, are located 6o - 5o = 1o above the western mouth of the Niger, because it happened during the reign of the 1st king Teti (c.2370-2338 BC) of this dynasty. Cape Lopez (Port-Gentil) is located at 1oS. This is 4o + 1o = 5o below Cape Formoso and Mount Cameroon, encoding the 5th Dynasty which was ended because of the Flood. It is 5o + 1o = 6o below the western mouth of the Niger, because it happened in the 6th Dynasty. Cape Lopez is located at 1oS, which confirms that it occurred during the reign of the 1st king Teti. The mouth of the Congo River is located 6o - 1o = 5o below Cape Lopez, confirming the 5th Dynasty, which was ended because of the Flood. The mouth of the Congo is situated at 6oS, confirming the 6th Dynasty, when it happened. It is located 12 - 9 = 3 moiras east of Ikom, illustrating the 30 days of the month, again. The south side of Lake Chad is located 14o - 9o = 5o east of Ikom, encoding the 5th Dynasty which was terminated because of the Flood. The east side of the Lake is located 15o - 9o = 6o to the east, corresponding to the 6th Dynasty when the Catastrophe occurred. The difference between these geographic locations is 15o - 14o = 1o, encoding the 1st king Teti. It happened during his reign, in the year of c.2344 BC (tree-ring dating). Terrace Bay, Namibia, is located at 20oS, which is 20o + 30o = 50o below the Nile Delta, the center of the Northern Egyptian Empire. So, it represents the 5th Dynasty, which was ended because of the Flood. The upper part of the Orange River in South Africa flows around 30oS, which is 30o + 30o = 60o below the Nile Delta. It symbolizes the 6th Dynasty, when the Comet Catastrophe occurred. This latitude-line is 10o, or 1 Moira, below Terrace Bay, encoding the 1st king Teti. It happened during his reign. The confluence of the Niger and Benue Rivers is located at 8oN, encoding the total precipitation of the Flood, 80 micromoiras = 80 x 0.11 = c.9 meters of water. The amount of water corresponds with the volume of an ice-ball having a diameter of 200 km. The Benue River starts at about 10oN. The complementary latitude at 90o - 10o = 80oN confirms the precipitation. The coast near Lomé, Togo, is located 9o - 1o = 8o due west of Ikom, confirming the precipitation of 80 micromoiras. The west side of Lake Chad is located 14o - 6o = 8o north of Ikom, and the south coast of Benin, confirming it, again. Fig.2 Chief S.E. Akong besides an Ikom Monolith near the village of Alok. The traditional symbol of a Comet is Greenland as the Head of the Comet, and the North Atlantic Ocean as its Tail. Greenland, which consists of ice and stones, was already discovered c.3300 BC.7-9,23,24 Ikom, at 6oN, corresponds to Cape Farvel, the south point of Greenland, at 60oN. Both places each encode the 60 days, when the planet Earth was inside the Tail of the Comet, as well as the 60 days after it, when the rain storms and floodings continued. The island of Bermuda is located at 32oN. It was discovered by the last king Unas of the 5th Dynasty (c.2403-2370 BC).25-27 Its position is 32o - 12o = 20o above the North Cape of South America, confirming the two time periods of two months. This North Cape is located 12o - 6o = 6o higher than Ikom and the Bight of Benin, confirming the two time periods of 60 days. It is located at 12oN, confirming the total duration of the Flood of 2 x 60 = 120 days. Cape Farvel, the south point of Greenland, is located 60o - 12o = 48o above South America, confirming the original world population of 4.8 million men. The island of Bermuda is located 32o - 6o = 26o above Ikom and the Bight of Benin, confirming the 2.6 million casualties (54%). The Azores archipelago is located at 38oN. It was already discovered c.3600 BC.8,23 Its position is 38o - 12o = 26o above South America, confirming the 2.6 million victims. The maximum height of the continent of South America is 12o + 56o = 68o, or c.7 Moiras, confirming the 7 figures of this number. Ikom, Nigeria, is located 60o - 6o = 54o below Cape Farvel, the south point of Greenland, confirming the percentage of casualties, 54%. The Azores are located 60o - 38o = 22o below Cape Farvel, Greenland, confirming the 2.2 million survivors. Most of them were seriously wounded. At the east side the north coast of South America is located at 11oN. It is 11o - 6o = 5o above Ikom, confirming the 5th Dynasty, which was ended because of the Flood. It is 60o - 11o = 49o below Cape Farvel, or c.5 Moiras below this Cape, confirming the 5th Dynasty. The north cape of South America is located 12o - 6o = 6o above Ikom and the coast of Benin, confirming the 6th Dynasty, when the Catastrophe ocurred. The difference in latitude equals 12o - 11o = 1o, encoding the 1st king Teti (c.2370-2338 BC). It happened during his government. The latitude of the island of Bermuda, at 32oN, confirms his 32 years of reign. The stone circle is also the symbol of the spherical Earth. Stone circles were made after the discovery of America (c.2500 BC), when (almost) all the land on Earth was discovered.25 The stone circles of Ikom were constructed above the Cross River, at 6oN. So, these date from after the 6th Dynasty, which was the last one of the Old Kingdom. It means, that the later culture in Nigeria was based on the Sun religion as formulated in the Old Kingdom. The Ikom Monoliths (1200 BC-200 AD) are a tribute to the lost civilization of ancient Egypt, which vanished because of the Biblical Flood. It appears to be a fact, that many of the Ikom Monoliths are hewn into the form of a phallus. Although a sexual association remains possible, it should be realized that it also resembles the shape of a Comet. There might be even a relation between the name of Ikom, and the word of Comet. 50 km north of Ikom is the town of Nkomfap, which name may be related as well. The ancient Egyptians called their land Kemi or Kemet. All these names might have a common root. People, who traveled from south to north passing the Cross River, thought they were crossing a time barrier from the time of the Old Kingdom in the south, to the time after the Flood in the north. So, the Ikom Monoliths are a testimony of the religious ideas of the people of Nigeria about the time period of the Old Kingdom of Egypt. 4. Shaw, I., and Jameson, R., A Dictionary of Archaeology, Blackwell, Oxford (1999) (ISBN 0-631-17423-0). 12. Peiser, B.J., “Evidence for a Global Disaster in the Late 3rd Millennium BC”, Ref.11, pgs.117-140. 13. Baillie, M.G.L., “Hints that Cometary Debris played some Role in several Tree-Ring Dated Environmental Downturns in the Bronze Age”, Ref.11, pgs.109-117. 16. Joseph, F., Survivors of Atlantis, Their Impact on World Culture, Bear & Co., Vermont 2004 (ISBN 1-59143-0-040-2). 17. Grondine, E.P., Man and Impact in the Americas, Kempton, Illinois (2005) (ISBN 0-9776-152-0-0). 19. De Jonge, R.M., “Discovery of America and the Flood (c.2300 BC, Ita Letra, Villarrica, Paraguay)”, Ref.7, to be published. 20. De Jonge, R.M., “The Discovery of Australia and the Flood (The Rainbow Serpent Shelter, Mt. Borradaile, Arnhem Land)”, Ref.7, to be published. 21. De Jonge, R.M., “The Brandenburg Stone, Comet Catastrophe of 536/540 AD” (560 AD, Battletown, Meade County, Kentucky), Ref.7, to be published. 22. De Jonge, R.M., “The Myths of Monks Mound (Cahokia, Illinois, 650-1400 AD)”, Ref.7, to be published. 23. De Jonge, R.M., and Wakefield, J.S., “The Discovery of the Atlantic Islands”, Ancient American, Vol.13, No.81, pgs.18-25 (2008). 24. De Jonge, R.M., and Wakefield, J.S., “Greenland, Bridge between the Old and New World, c.2500 BC”, Ancient American, Vol.11, No.67, pgs.12-20 (2006). 25. De Jonge, R.M., “The Discovery of Three Continents (Santo Stefano, North Sardinia, Italy, c.2300 BC)”, Ancient American, Vol.12, No.76, pgs.28-29 (2007), Ref.7. 26. Casson, L., Ships and Seafaring in Ancient Times, British Museum Press, 1994 (ISBN 0-7141-1735-8). 27. Wachsmann, S., Seagoing Ships and Seamanship in the Bronze Age Levant, College Station, Texas, 1998.